The sixth time’s the charm. Since 2006, Wilfrid Laurier University’s athletics and recreational program has received recognition from the Canadian Intramural Recreation Association (CIRA) Ontario for excellence in intramural and recreation programming. The CIRA, formerly a national organization, is a non-profit organization that focuses on encouraging, promoting and developing active living in Ontario schools. The Intramural Award from the CIRA requires programs to offer a variety of activities, promote fun, active participation, fair play and must involve students in a leadership role. Institutions must apply for the award and are placed through an application process that analyzes that the school has demonstrated and fulfilled the CIRA’s expectations. According to Raithy, the CIRA looks for students participating as much as possible. An estimated 7000 students use and engaged in programs offered up by Laurier’s athletic and recreation programs. It offers up a lengthy list of physical activities ranging from organized sport to fitness and wellness classes, to even leisure activities. Patricia Kitchen, the associate director for Laurier’s recreation and facilities spoke on behalf of the programming, expressing Laurier’s delight to being recognized for another year. “Part of our philosophy is that we are very student-leader driven,” Kitchen explained. “We don’t have a large full-time staff so we rely significantly on student leaders to really run our programs and services. The growing recreational program is also thought to have been a result of the restructuring of the administrative budget. In April 2011, Laurier’s athletics and recreation made the decision to eliminate its varsity volleyball program to respond to financial issues and space constraints. The decision received much negative backlash from students and volleyball alumni, whom supported the athletic program for over forty years. Dissolving the volleyball program also allowed Laurier athletics to respond to the transfer of athletics and recreation clubs from WLUSU and provide more facility space for intramurals. 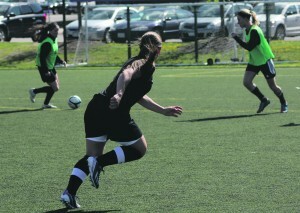 Statically speaking, in the fall of 2011 following the cut, Laurier increased intramural participation by seven per cent, adding 21 teams and 320 new participant opportunities. In addition, the program was able to add ten athletics and recreation clubs to their offerings. Laurier has also grown to 19 sanctioned clubs this year. Regardless of the promising numbers, Kitchen explained that the most rewarding component of the program is the constant interest and positive feedback.